Montefiore Home Care is a certified, Joint Commission-accredited agency focused on helping people in all stages of life get access to a range of highly trained clinicians, services and programs. Established in 1947, Montefiore Home Care is the nation's first hospital-based agency, created to allow newly discharged patients the benefits of at-home recuperation and recovery by providing supportive healthcare in the home. It was an innovative concept, referred to as a "hospital without walls," that gave outpatient access to nursing care, rehabilitation therapies and social work services, specifically tailored to individual needs—an essential lifeline for those transitioning from the hospital to homes. The program continues to evolve and grow. 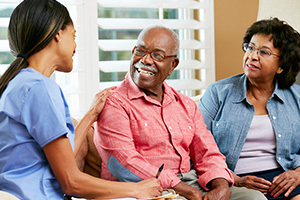 An interdisciplinary team of nurses, physical therapists and social workers provides a spectrum of care from basic interventions to complex therapies, all focused on enabling patients to remain within the comfort of their own homes. Our patients can rest assured knowing that services and therapies administered at home are provided with the same level of attention and care offered at Montefiore. Montefiore Home Care is an option for anyone in need of skilled services ranging from physical, occupational and speech therapies and postpartum assistance to in-home laboratory services, behavioral health, telemedicine and joint replacement programs. Interested in finding out if home care is right for you or your loved one? We invite you to learn more about our programs and services, read our list of frequently asked questions or contact us for additional information.